We may think of Internet of Things (IoT) devices as futuristic looking objects in the home that can lower energy costs and open garage door for you. 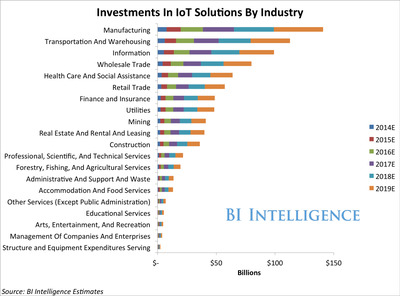 But the IoT is actually much more important to the enterprise sector. IoT devices and software can offer businesses huge benefits, including better security, more effective monitoring of machinery and equipment, efficiency, energy management, and more. In a new IoT report from BI Intelligence, we size the enterprise IoT market, noting the breakdown between hardware versus software spending, and determine which industries will upgrade to the IoT first. We examine how businesses are already using IoT systems and what barriers might still stand in the way of IoT enterprise upgrades. The enterprise sector will account for 39% of the roughly 23 billion active IoT devices we expect by the year 2019. We believe it will be the largest of the three main IoT markets including enterprise, home, and government. Spending on enterprise IoT products and services will reach $US255 billion globally by 2019, up from $US46.2 billion this year, according to our estimates. This represents a 5-year CAGR of 40%. 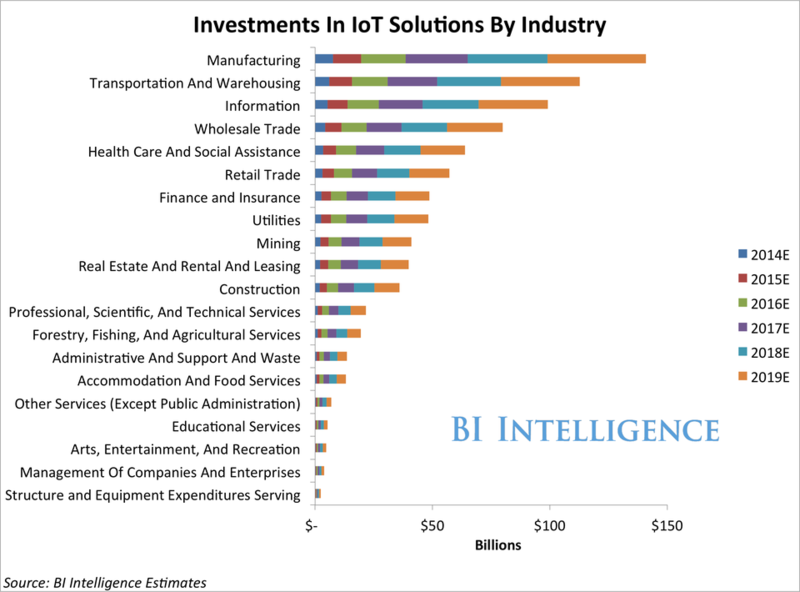 Enterprise IoT software providers will earn far more than those who provide IoT hardware. Enterprise-focused IoT software and services sales will reach $US43.9 billion by year-end, while hardware will account for about $US2.3 billion in revenue, according to our estimates. The manufacturing, transportation and warehousing, and information sectors will invest the most in IoT systems and devices in the next five years, we estimate. Manufacturers are currently the leading industry to use IoT devices and we estimate there total IoT investment will reach $US140 billion over the next 5 years. For full access to all BI Intelligence reports, briefs, and downloadable charts on the Internet of Things and mobile computing markets, sign up for a trial membership.